As NYC lovers through and through, we've always been charmed by Bond No. 9's elegant fragrances that are inspired by New York neighborhoods. From Astor Place to Chinatown to the High Line Park, each fragrance aims to capture the scent and feel of the area, all housed in bottles that could be works of art themselves. So of course, we could not be happier that one of the city's most popular landmarks, Central Park — is being captured in a bottle this spring as the new Central Park South Eau de Parfum. With notes of violet leaves, tuberose, accacia, jasmin, sandalwood, and musk, this fresh floral evokes the scent of that first walk in the park when the blooms arrive — plus, it's adorned with a Swarovski-designed floral bracelet that can also be worn as a brooch. Spring may be especially teasing this year (hear that, Mother Nature? You're killing us), so you better believe that we'll be spraying this scent and sporting this pink fleur as a talisman that will somehow — we hope — allow us to picnic in the real Central Park as soon as possible. Bond No. 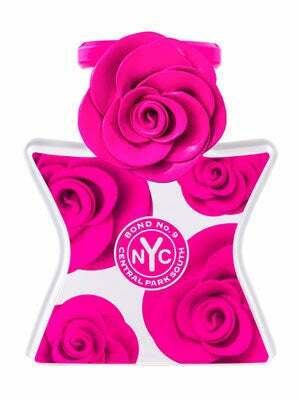 9 Central Park South Eau de Parfum, $390, available at Saks Fifth Avenue.